I'm currently working on performance optimizations for Project 5: Sightseer, and a part of that involved editing the UnityEngine.dll to fix a nasty bug Unity introduced back in ~2014 that they seem to refuse to fix. That bug, is an absurd amount of GC allocations coming from the AttributeHelperEngine. Amusingly, the bug has been reported to Unity years ago, alongside the code required to fix it (https://fogbugz.unity3d.com/default.asp?746364_pjnmdhk7c9imgdsk)... and yet -- Unity refused to do anything about it, claiming that a future redesign of the system will fix it. Well, guys -- fast forward to several years later -- the bug is still there, all the way in Unity 2017.2, and no actions have been taken to address it. Anyway -- this post isn't meant to be a rant about Unity's choices -- I'll do that in another one. Instead, let me explain how you -- the developer -- can fix this problem yourself, to an extent. Fortunately, this particular problem comes from the side of Unity that lives in the UnityEngine.dll file, and C# files are quite easy to modify. The first thing we need to do is make a new C# project in Visual Studio. I was editing Unity 5.6.4f1 -- so I made the application target .NET Framework 3.5. "The Output type" needs to be a Class Library -- as we need to create a DLL with the edited functions first. This simple DLL will not be referencing any Unity classes, so there is no need to reference the UnityEngine.dll. Compile the DLL (I targeted Release) and move it into the solution folder, or somewhere you can find it. I called mine FixUnityEngine.dll. If you choose to fix it by adding caching instead, like in the bug report's suggested fix code, you will need to reference the UnityEngine.dll. Personally, I saw no adverse effects of simply returning 'null' in Sightseer. Worked just fine. The next step is to create a program that will replace the code in one DLL (UnityEngine.dll) with code from another (FixUnityEngine.dll). Since I no longer needed the code above, I simply commented it out, choosing to reuse the project instead of making a new one -- but if you plan on editing your replacement code you may want to create a separate VS solution. You may notice that I'm referencing a local copy of UnityEngine.dll -- I chose to copy it to the project's folder, but you can reference it all the way in Program Files if you like. Its default location is "C:\Program Files\Unity\Editor\Data\Managed\UnityEngine.dll". So what does the code do? It simply reads the two DLLs and replaces the body of one function with another! In the replacement DLL I kept the same namespace, class name and function names for consistency (but as far as I can tell this isn't actually necessary). In my case though, since I did, the code to perform the replacement ended up being shorter. Once you compile and run the program, it will spit out an edited version of the DLL (UnityEngine_edited.dll). Simply close all instances of Unity and replace C:\Program Files\Unity\Editor\Data\Managed\UnityEngine.dll with this version. That's it. There's nothing I can do about Unity calling this useless functions, and indeed in my project Unity doing so wastes 0.16 ms per call to AddComponent... but at least the 325 MB of memory allocation is gone. Yay for small victories. I'm trying to optimize my Unity app, and to get rid of all this garbage ! 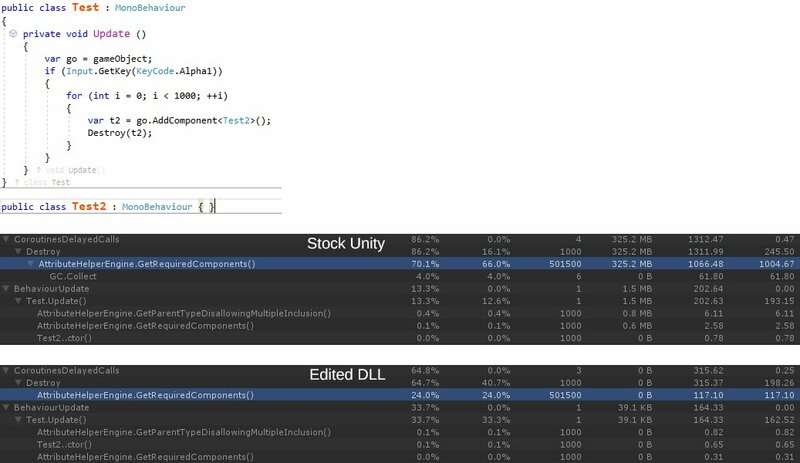 I've followed what you explain in this post, and managed to create a new UnityEngine.dll, but I still had the same amount of garbage created in your test scene, using Unity 2017.3.1f1. I was wondering what I was doing wrong, then I decided to try it in another version of Unity (2017.1.1f1), and this time it worked, no more garbage ! Have you tried it yourself in 2017.3 ? Would you have any idea why it works in 2017.1, and not in 2017.3 ? Yes, I tried it in 2017.3 a while back. It worked as expected. You probably just missed something. Unity's reference code can't be compiled. Not sure what you're trying to do there.